Tubby, Jasper and I went away last month for his birthday celebration. It was a pretty relaxing trip - nice but it all ended too fast. The mini cottage we stayed was called "The Sand Piper" - interestingly had no sand or whatsoever within. But it was cosy and they also gave us a free welcome hamper with a bottle of wine, jam, yogurt, fruits, bread and stuff enough to feed our nibbling habits for the 3 days there. Day 1: We arrived there Sunday around 2pm and went up to Arthur's Seat. There, you could get the most wonderful view of Port Phillip bay. Nothing else much except the nice view - there used to be a ski lift there but is now closed due to safety issues. More views of the bay when we dropped at some garden which I can't remember what it's called. All I know was that it had 2 sculptures which were supposedly scalped by a popular artist which we don't know who. :p Next we dropped by the enchanted mazes, but they weren't open and so we only took some photos from the veranda. As most of you know, Tennis has been like part of Tubby's and my life since 3 years ago. From the lessons and social comps, we got to meet new friends who later became our tennis comp team mates as well. And so James invited us to his house for his house-warming. So embarrasing we didn't know it was his birthday and didn't get him anything. Top Left - L-R: Weiwei, Sam (our tennis coach from Singapore), James and Jame's friend. 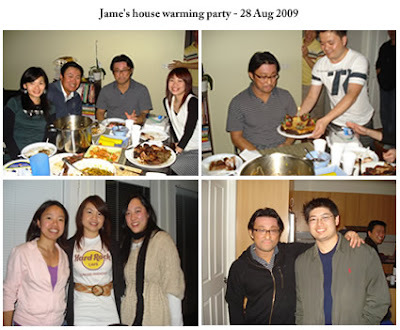 Top Right Pic: Jame's housemate bringing out his birthday cake. Bottom Left: Yin-Pin, me and Penny (our other Summer Tennis Comps team mates). Bottom Right: James and Tubby! 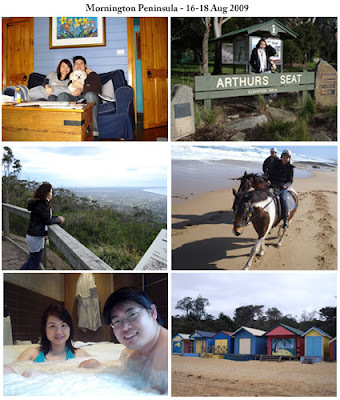 Sorry I know I have been rather lazy updating my blog regularly. Am planning to take some time during the Melbourne Cup long weekend to get a whole new overhaul for my blog including new templates and stuff and hopefully the updates will be more frequent then! Till then, enjoy the coming Spring all!